By Robert C. Jones Jr.
Andres Ruiz had always chalked it up as just part of the game. Broken bones, torn ligaments and other injuries, he knew, occur in every high-impact sport, and baseball was no exception. But when a fractured hip sidelined him from the sport he was passionate about since he was 5, Ruiz made a decision to become a biomedical engineer, choosing the field because of its ability to mitigate injury and disease. Today, as a senior majoring in biomedical engineering at the University of Miami, Ruiz is excited about a new UM-based lab that has the potential to help revolutionize not only his discipline but other areas of engineering as well. 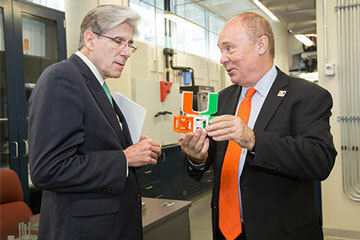 Dedicated on Monday, Oct. 23, the new UM College of Engineering-Johnson & Johnson 3D Printing Center of Excellence Collaborative Laboratory will support joint research, materials development, and testing of 3D printing technologies and processes. UM faculty and students will have access to the lab’s state-of-the-art three-dimensional printing—or additive manufacturing—equipment, which is housed in a 5,850-square-foot “collaborative laboratory” inside the McArthur Engineering Building and includes ten 3D MakerBots that use polymers to create objects, and two 3D metal printers—one that uses titanium powder and the other, stainless steel. Students will work alongside J&J engineers and scientists, gaining invaluable experience. Provost Jeffrey Duerk, President Julio Frenk and College of Engineering Dean Jean-Pierre Bardet at the opening of the Collaborative Laboratory. Indeed, 3D printing—the process of making three-dimensional objects by adding materials such as plastics or metals in successive layers—has been hailed as a game changer for everything from the medical to automotive and aerospace industries. But 3D printing is not new. The technology has been around for more than 30 years, Joseph Sendra, worldwide vice president of manufacturing engineering and technology at Johnson & Johnson, noted during the dedication ceremony. “What’s different today is the cyber-physical interconnectivity between man and machine. It’s the digital coming together with what’s real,” said Sendra, who graduated from UM’s College of Engineering with a degree in industrial engineering in 1993 and is one of three UM alumni who helped bring the new Collaborative Laboratory to UM. “Additive manufacturing let’s you envision what’s possible,” he said, encouraging students to take advantage of the opportunity to collaborate and learn from J&J engineers. Aerospace engineering major German Acosta Quiros, a junior, is already taking advantage of that opportunity. An intern in the Collaborative Laboratory since July, Quiros has been working with polymers and adhesives to optimize certain manufacturing processes within the biomedical field, specifically reducing the time it takes to manufacture catheters. And two weeks ago, the Hammond Scholar 3D printed a component for a hot-air blower system on which he’s been working. “It wouldn’t have been possible without the Collaborative Laboratory,” he said. 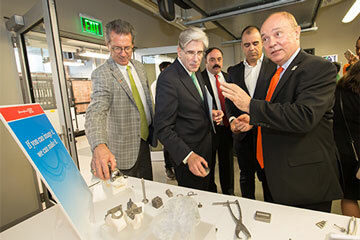 Dean Bardet explains to President Frenk how materials were produced using 3D printing technology. At the event, guests were allowed to tour the new facility, which, in addition to its suite of 3D printers, includes a variety of other equipment—from a special furnace that strengthens certain materials by changing their microstructure, to instruments that measure the chemical composition of different powders, to microscopes used to examine the quality of different materials. UM researchers are excited about the facility. Nurcin Celik, an associate professor of industrial engineering, says the new lab will help her complete a research project on the impact of single-stream recycling (SSR) on recycled paper products. Celik’s project, she said, will not only investigate new and promising ways to decrease contamination but could also lead to more efficient re-manufacturing techniques with recycled materials. Ryan Lee Karkkainen, assistant professor in mechanical and aerospace engineering, hopes to use the lab to study the microstructure of certain materials with the hope of devising a process to make them stronger. Ashutosh Agarwal, assistant professor of biomedical engineering, also has projects underway that stand to benefit from the Collaborative Laboratory. His organs-on-chips research can emulate a heart, pancreas, and other organs on a chip about the size of a USB stick, allowing his team to conduct risk-free biomedical testing.